I'm joining Weekly Words To Live By over at Notes from A Cottage Industry. begins on Monday August 16th! and met so many really nice bloggers and readers. advertising, music, content and memes/parties/anniversaries. I thank all of you who commented and emailed with your thoughts. Here is what I've decided. It will be a low key event. 1. To qualify you must be a PUBLIC FOLLOWER of The Little Round Table. Sunday August 22, 2010, when the drawing for prizes will take place. entered into the drawing pool only once, with FIVE chances to win. Level playing ground for all public followers. midnight Sunday August 29, 2010 to collect their TLRT Gift Dollars. time frame, alternate name(s) will be drawn. Ohhhhhhhh!!! Anticipation, hurry up 16th! Thank you both, I am looking forward to the giveaway and it is coming up fast! Melanie - I'd love to see pictures of your hutch! Yay!! 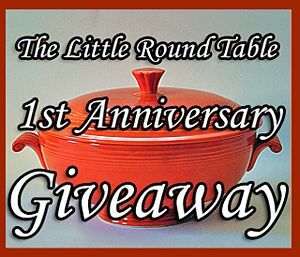 I am a new follower.Come by my blog and enter my giveaway! It's also a pretty good one! Thanks meeyeehere, hope you'll drop by again to enter the giveaway. Yep, now counting down the hours! Hopefully NOT. I actually had a dream last night that blogspot went down and lost my WHOLE blog.